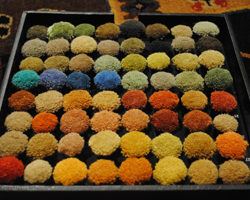 Do you love a rug but one or more of its colors aren’t right for you? What if you need it in another size or shape? Ageless Rug Treasures would be thrilled to help create the perfect rug for you. If you see another size or shape, or we don’t have exactly what you are looking for we can show you a “rendering” (illustration) of exactly how the design will look in the size or shape you’re considering! This means you can decide how the pattern translates before it is woven just for you. We have created hundreds of custom rugs over the years and we would love to help you get the rug that is specifically made for your taste. This is just one of our yarn sample trays to choose colors from. A strike-off (small sample) woven to show a potential custom color way of the large rug behind it. If you like the strike off then we can have it woven in the size or shape rug you care for. Purchasing rugs can be a very overwhelming experience. How do you know what quality a rug is and what a fair price for it is? 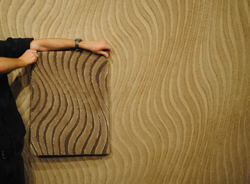 How do you choose a rug that will be beautiful in your room? How large should the rug be, etc., etc. I’m more than happy to help you understand all this. We want the process to be as easy as possible. It will help when you visit to bring fabric swatches, paint samples, throw pillows, etc. Some pictures on your camera of the space would also be helpful. If some rugs look to be possibilities I’m happy to deliver them at no charge for you to see at home overnight. If you don’t care for any of them it’s no problem. I want you to be happy if you make a purchase. I don’t believe in high-pressure sales—ever! You’ll find shopping here a relaxed experience.